Christopsomo, which translates as “Christ’s Bread”- pron. Christopsomo also named kouloúra tou Christoú (round bread of Christ), is usually a round loaf often made with the same ingredients as Easter bread. Raisins, nuts, cinnamon, cloves, and nutmeg are just a few of the taste treats found in this traditional sweet loaf. Today, making Christopsomo is still considered by many to be a sacred task, and great care is taken in its preparation. It is always decorated with a cross and other patterns. (Christopsomo (bread of Christ) graces the Christmas table. Christ Bread was once the centerpiece of traditional Greek Christmas tables, as were large quantities of dried figs, nuts and honey. Traditionally on Christmas Eve every household would bake a Christopsomo or “Christ bread”. Baked with the highest quality ingredients (housewives used knives or forks to decorate the bread with symbols that represented the main occupation of the household. The plentiful use of grains and nuts as symbols of fertility and good harvest is reminiscent of the ancient Kronia festivals (similar to Roman Saturnalia) held in Attica in honour of Cronus, the god of the harvest. Some families attend church on Christmas Eve and return home for a meal that begins with the cutting of the Christopsomo by the head of the household. Others wait until the main meal on Christmas Day. The head of the house makes the sign of the cross on the bread with a knife while saying, “In the name of the Father, the Son, and the Holy Spirit….,» and then cuts a piece for each person with a wish of “Kalá Christoúyena” (“Happy Christmas”) or “Chrónia pollá” (“Live Many years”). 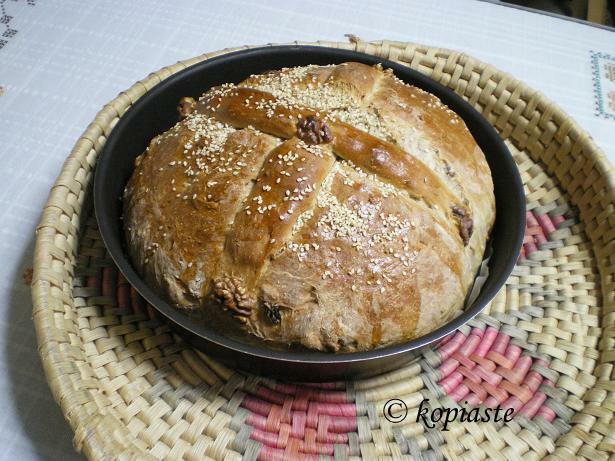 In Cyprus, a special bread called “Gennopitta” and other yeasted pastries covered with sesame seeds and a cross on top are prepared. For blessings on the house, one will be hung from the beam of a ceiling or maybe in front of the home ikonostási (where the icons are placed) through Christmas or New Year’s Day. Mix the yeast with 1/2 cup of warm water and ¼ οf flour, stir until dissolved. Cover with plastic membrane and clean napkins or even a small blanket and leave it to rest all evening. Next day, in a large mixing bowl, sift 2/3 of the remaining flour and add salt. Make a well in the centre of the flour and pour in the yeast mixture, the warm water and wine. Mix until a soft dough forms, cover with plastic membrane and a damp towel, and set aside to rise for 1 1/2 to 2 hours, until doubled in bulk. Punch the dough down and knead for several minutes until any air pockets are gone. Sift in the remaining flour, add the oil, orange juice, brandy, and grated orange peel. In a small bowl, mix the sugar, raisins, walnuts, pine nuts, mastic resin or anise, cinnamon, cloves, coriander, cardamom and nutmeg until blended, and add to the dough. Knead well until the dough is firm and doesn’t stick (about 10 minutes), cover, and allow to rise for 1/2 hour. Line two 26 cm baking tins with parchment paper and lightly brush with oil. Shape the bread into two circular loaves, about 8 inches in diameter, keeping a fistful of dough for decoration. Pat the dough back into shape to rise. When risen, use the small pieces of dough to create designs… roll them out into strips and coil around whole walnuts pressed into the top, or make them into the shapes of your choice and place on top of the loaves. Cover with plastic membrane, a dry cloth and a damp cloth over that, and place in a warm place to rise again, until doubled in size. Brush the bread with milk and scatter with sesame seeds. Preheat oven at 180 degrees C and bake for about 1 hour 15 minutes, depending on your oven. If it is a cold day, prepare a meal which needs to be baked in the oven. This way the kitchen will be warm and will enable the dough to rise. Use a mortar and pestle to crush the anise seed, coriander, cardamom, cloves and mastic resin or an electric spice grinder. Christopsomo, which translates as "Christ's Bread"- pron. Christopsomo also named kouloúra tou Christoú (round bread of Christ), is usually a round loaf often made with the same ingredients as Easter bread. Raisins, nuts, cinnamon, cloves, and nutmeg are just a few of the taste treats found in this traditional sweet loaf. Knead well until the dough is firm and doesn't stick (about 10 minutes), cover, and allow to rise for 1/2 hour. Line a baking tin with parchment paper and lightly brush with oil. Shape the bread into two circular loaves, about 8 inches in diameter, keeping a fistful of dough for decoration. Pat the dough back into shape to rise. When risen, use the small pieces of dough to create designs... roll them out into strips and coil around whole walnuts pressed into the top, or make them into the shapes of your choice and place on top of the loaves. Cover with plastic membrane, a dry cloth and a damp cloth over that, and place in a warm place to rise again, until doubled in size. Ivy, the bread looks wonderful. Have a piece for me with coffee this afternoon. Actually it has disappeared, but I am baking Cypriot cookies today. Tomorrow I will have cookies and Greek coffee for you. Looks wonderful! Comes on my baking list! Is this recipe for one or two loaves. I use the same spices for other bread and what I do is put all the spices in a cup of boiling water and steep as tea. Then I add the spice water to the flour mixture. Yes, at least two large ones.